Facts and history about the life and lifestyles of Native American Indians. American Indian Artifacts provide an insight into to the lives of the indigenous people of America. Artifacts are man-made objects such as weapons, tools or ornaments that have survived from the past and are of historical interest. The oldest Artifacts, such as arrowheads, date back 14,000 years and span across the Paleo-Indian Era (Stone Age culture) and the Clovis and Folsom cultures. Other cultures developed over the years, different materials became available, and the skills of Native Americans increased to produce the American Indian Artifacts that are so greatly valued in the modern day. The life, history and lifestyle of Native American Indians is a varied and fascinating subject. 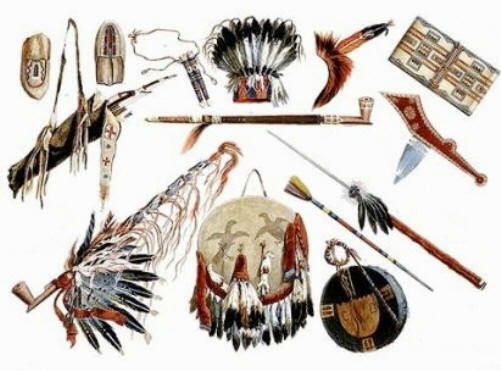 The following fact sheet contains interesting facts and information on American Indian Artifacts. American Indian Artifacts Fact 7: Bone Weapons and Tools: Bone Weapons have also survived the test of time and include Jawbone clubs, and Gunstock Clubs. Tools made of bone included awls, arrow straighteners, billets and sewing needles.